On this page I include shapes outlines which appeared in Catalogues and Brochures which I hope will be a useful aid to identification. The earliest guides appear to have been produced to assist the retailer and included "ex-works" price lists. I suspect that the high cost of producing these catalogues meant that they could not be made widely available. Shape 24 "Kent" appears to have been superseded by the use of "Surrey" to describe both shapes. 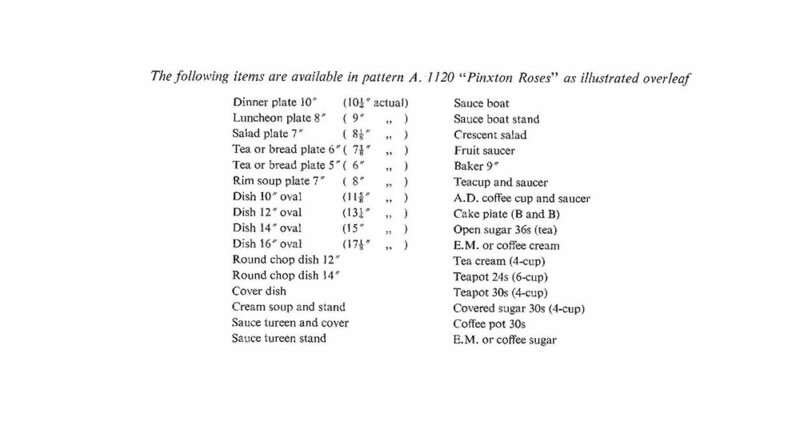 Similarly in later catalogues shape 14 "Somerset" is described as a tea cup and saucer (tall) in the "Beaufort" shape. This December 1952 guide also lists the "Composition of Services" which varied depending on whether or not the goods were intended for the UK or Canadian market. I have included this information below as it does give an indication as to exactly how many pieces constituted a particular service. Above is a sample price list page. It shows the lowest prices listed. Unfortunately it is not clear which price bands relate to a particular pattern. It is useful in that it shows the full range of items which could be incorporated in a service. One way of securing a competetive advantage was to supply items of a greater size than the trade size. This was standard practice in the industry. Hence the list above quotes both a trade and actual size. The catalogue below is undated, but some versions include an insert entitled "Outline Sketches of Shapes" which is dated May 1955. I believe that these were printed for retailers and perhaps favoured customers. This example was acquired from the Geoffrey Godden collection. I have only seen two others. There is no "s" in the pattern known as Ingleby. The pattern was presumably named after the hamlet on the River Trent situated between Stanton by Bridge and Repton. (Wikipedia). Note the correct spelling of "Edensor", a "Derbyshire village closest to Chatsworth House" (Wikipedia). There are some examples of heraldic ware with monograms on both the UK and Overseas Commissions pages to include plates with the Duke of Argyl's and Shah of Persia's crests. A968 also appears marked as A956. Bearing in mind that the gilders were paid on piecework basis it is hardly surprising that mistakes were made. Pattern A1012 Windsor is often confused with pattern A945 Ashby. Both are on the Burford shape, but the distribution of the posie sprays is different. The above image appeared in the Derby Evening Telegraph of Wednesday September 5th 1945 in an article entitled "Boom days for our famous china". 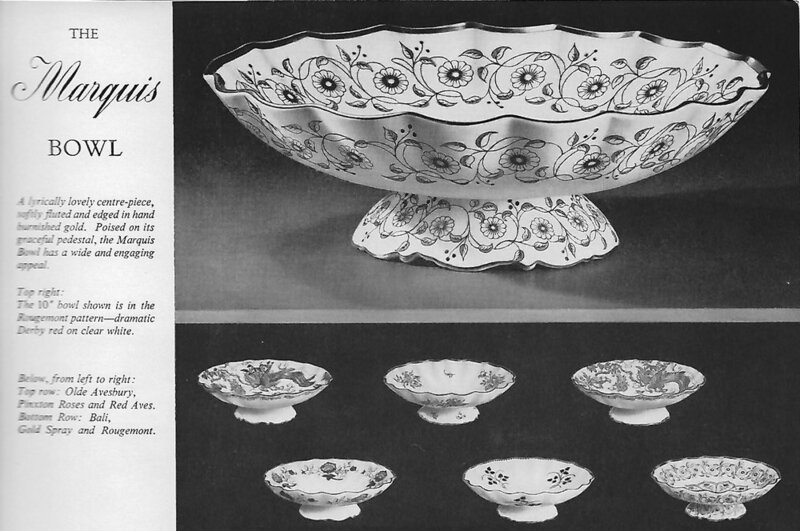 It was described as "An impression, drawn by Mr. P. Robinson, of the Crown Derby China Works as they will appear when the expansion scheme is completed. Inset is a sketch of the Duesbury works of nearly 200 years ago". It is interesting to note that at this time there were still four bottle kilns. The first electric kiln was not in use until 1946. I have seen this image reproduced without the inset showing the Duesbury works. I wonder if the original drawing has survived. The United States Ambassador to England 1941-46 was John Gilbert Winant (Wikipedia - see https://en.wikipedia.org/wiki/John_Gilbert_Winant). In an article which appeared in the Derby Evening Telegraph of the 28th July 1944 he was reported to have been presented with a casket. Caskets were also presented to Dr Wellington Koo, Field Marshal Smuts, Mr Mackenzie King and Mr Peter Fraser. Dr V K Wellington Koo was a Chinese Diplomat from the Republic of China and Ambassador to the Court of St James's 1940-46. Field Marshal Jan Christiaan Smuts was a prominent South African and British Commonwealth Statesman. He was Prime Minister of the Union of South Africa 1939-48. William Lyon Mackensie King was Prime Minister of Canada 1921-26, 1926-30 and 1935-48. Peter Fraser was Prime Minister of New Zealand 27 March 1940 - 13th December 1949. (Wikipedia). If anyone is aware of the present whereabouts of any of the caskets I would be delighted to hear from them. Below is the booklet "Outline sketches of shapes" dated May 1955. It shows the then current production, but with almost 2000 different shapes listed in Twitchett and Bailey, of which some were made in several different sizes, it is clear that this is only a guide to what was actually produced during the period. 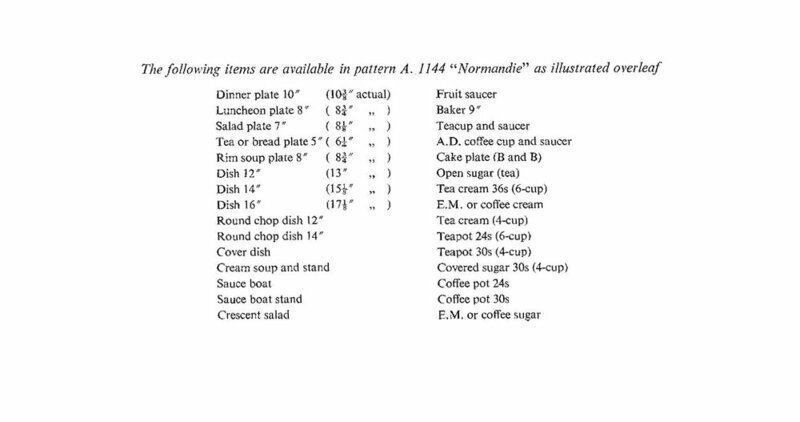 I have shown some examples of pieces which date from the period but which are not included included in the "outline sketches of shapes" on the "Fancy Items" page. 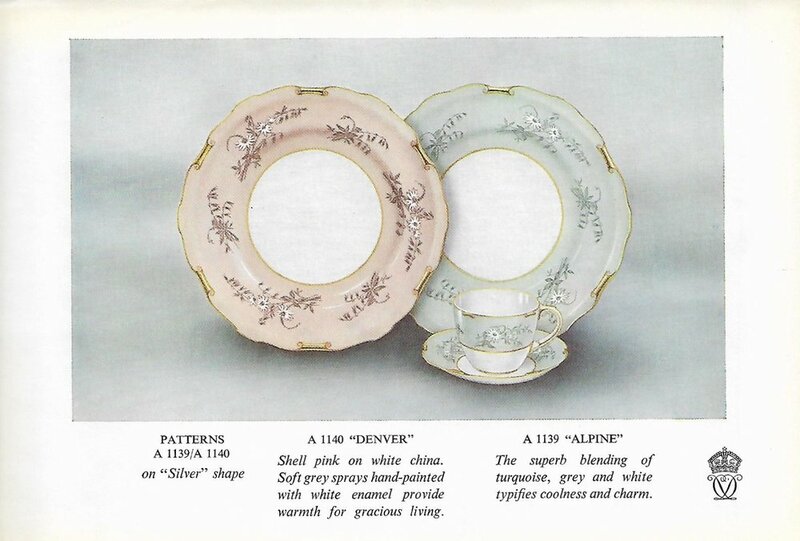 In the "Teacup" shapes dated 1952 shown at the beginning of this page a coffee cup and saucer in the "Surrey" shape was designated as being in the "Kent" shape. By this time it was presumably decided that any piece with the signature rope handle would be regarded as being in the Surrey shape. This page demonstrates the difficulty of identifying the various shapes. Dinnerware in the "Ely" shape was sold in combination with teaware in the "Chelsea" shape. Latterly to avoid confusion it would appear that the description "Ely/Chelsea" has been adopted. Below are images taken from a hardback album containing black and white photographs showing an extensive range of boxed items, most of which are in the posie pattern. The photographs were probably taken by Pat Laurie, but are not marked as such. The hard cover is well worn and there are numerous scribbled prices and crossings out. Perhaps it was used by a salesman to showcase the range of products. It is unfortunately undated but is probably from the mid 1950's. Outer cover of a Thomas Goode spiral bound catalogue which is unfortunately undated. I suspect that it was printed in the mid to late 1950's. It includes ware produced by a number of leading manufacturers including Royal Crown Derby. 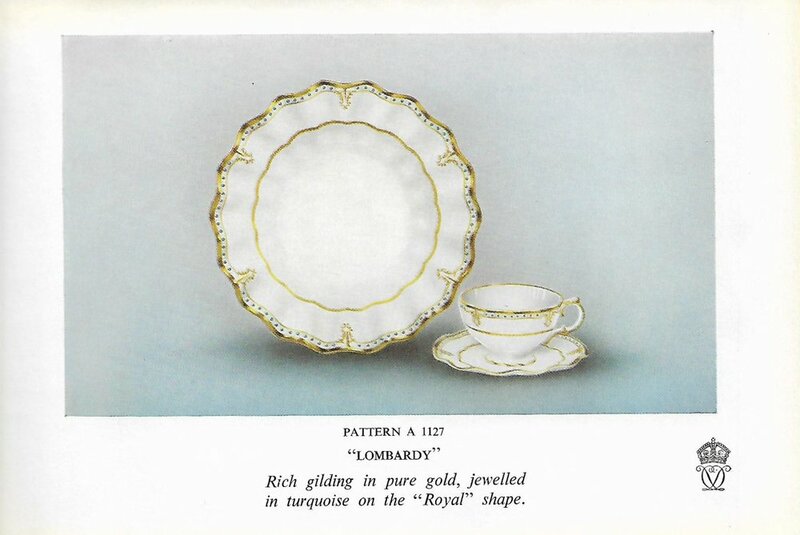 The page in the catalogue showcasing Royal Crown Derby. The patterns shown are as follows:- 7A A1012 Windsor. 7B A962 Gadroon Rose. 7C 2451. 7D A798 Chatsworth. 7E A962 Medway. 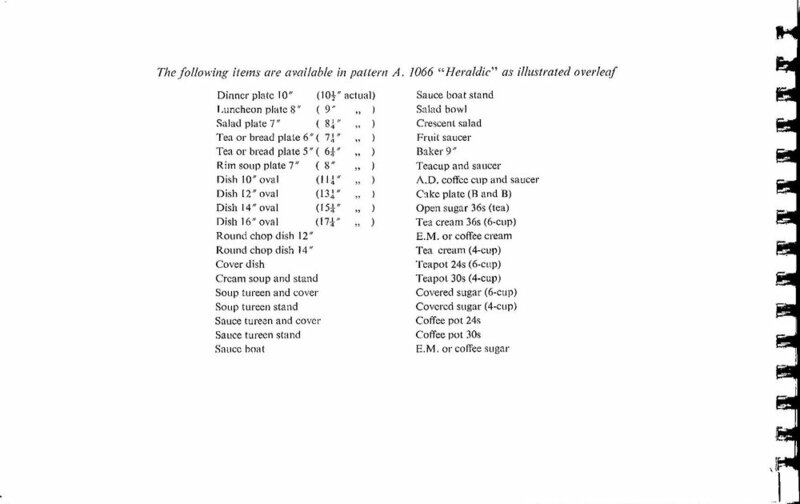 The catalogue included a price list and shape outlines which appear below. Patterns 7A, 7D and 7E are all in the Burford Shape. 7B is in the Gadroon Shape. Here we have a mixture of two different shapes. 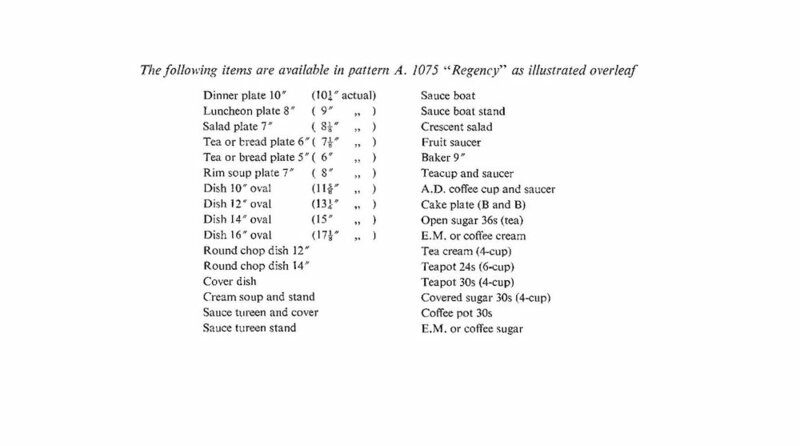 The teapot, cream jug, sugar basin, covered sugar and cake plate are all in the "Dover" shape, whilst the sauce boat and stand, covered vegetable dish, open vegetable dish and coffee pot are in the "Dublin" shape. I suspect that by this time the Dover shape was becoming less fashionable, or perhaps it was decided to reduce the range of shapes available. Printed menu prepared for the bi-centenary dinner held at the Midland Hotel, Derby on Wednesday 29th November 1950. 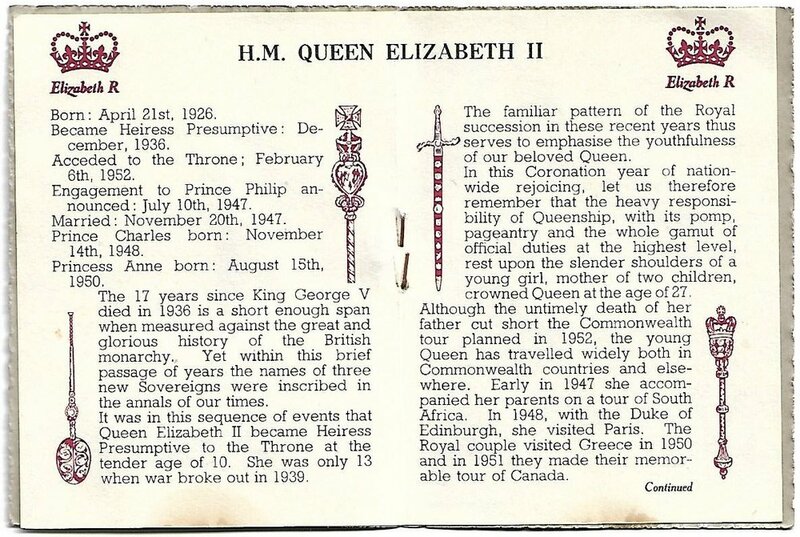 A leaflet enclosed with the oblong gadroon trays manufactured in 1953 to commemorate the Coronation. 60 thousand trays are reported to have been produced. 12 pages from a leaflet enclosed with boxed fancy items and dating from 1953-8. The sketches on the page entitled "Craftsmanship" are taken from photographs which are included in the "Archive Photographs" section. The image on the "To-day" page shows the semi-automatic casting machine in use. A second folded single printed sheet version of the leaflet with the addition of gilt borders. Front cover of a spiral bound catalogue produced for the US market dated January 1959 which was sent out to all US Crown Derby Dealers. 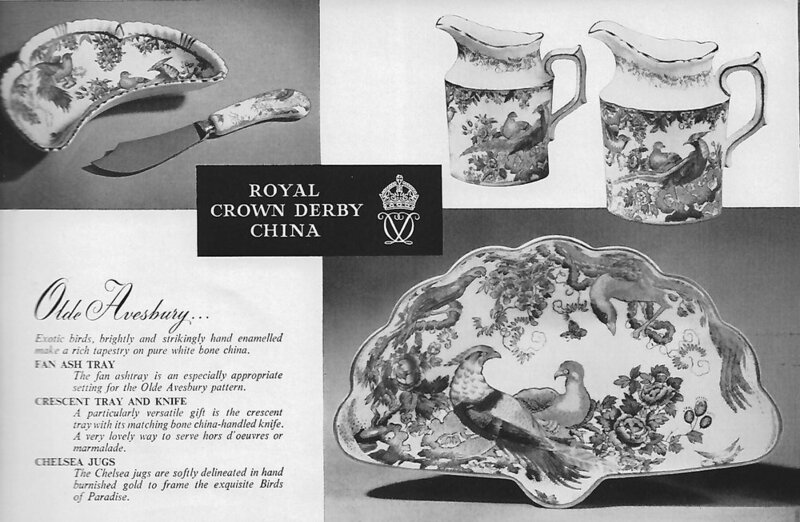 An accompanying letter from W. P. C. Adams, Vice President of Royal Crown Derby Inc. dated April 30th, 1959 is shown below. I suspect that few of these catalogues will have survived. A price list and order form were included in the mailshot. Some of the pages were printed double-sided, and these are included to show the range that was available in any particular pattern. The letterhead was designed by Howard Markoff, artist and US Army Ranger who had been a patient at Sudbury American Hospital. 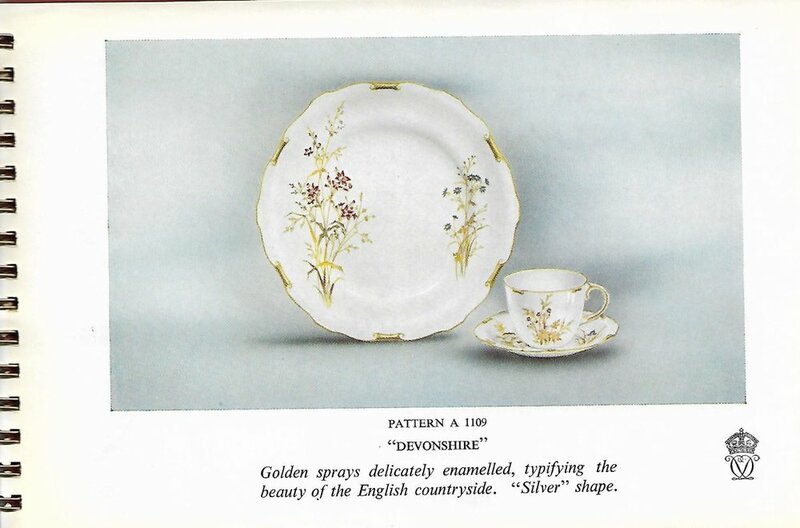 In an article which appeared in the Derby Evening Telegraph of Wednesday 22nd February 1956, disappointed with the printer's design, Colin Osborn is reported to have "remembered a favour done by Royal Crown Derby in 1947. An appeal came from the Derby St. Mary's Goods Depot, which handles much of the firm's freight. They knew Royal Crown Derby china was in short supply, said the depot's staff, but could the firm manage a posy tea-set for a wedding present? The firm made an exception and Crown Derby enthusiasts Miss Iris Holmes of Litchfield Drive, Alvaston, an office worker at the depot, and US Army Ranger Howard Markoff received the set from the depot on their wedding. Royal Crown Derby even went so far as to see to the china's packing when Mr. Markoff........took his bride back to the States. And wasn't Mr Markoff an artist? Mr Osborn contacted him at the big printing firm for which he is an artist and designer. What, design a letter-head for Royal Crown Derby? Mr. Markoff was thrilled. Delivered to Mr Osborn within a week was the completed job, pale blue paper bearing the tastefully-designed heading you can see reproduced above"